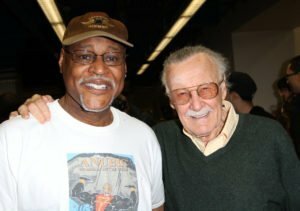 Stan Lee and Professor William H. Foster III in 2012 at the Big Apple Con. Simply put, Stan Lee’s accomplishments in the world of entertainment are worthy of mention, and I’m going to miss the guy. While some may dismiss him as the ultimate huckster for Marvel Comics, I will remember him differently. He brought fun and helped us all to realize that comic books, were an important medium of storytelling. Allow me to elaborate. Stan Lee was the guy who wrote and posted humorous and funny messages for comic book readers on the “Editor Page” of all of the comic books he edited. Even in his written words, he still had a distinctive voice. He was having fun and inviting his readers to the party. He was the creator of the “No Prize” contest, so named because that what the winner would get. He gave us the slang term, “ish,” short for “issue.” It was just the kind of fun posturing and geek wordplay his readers could appreciate. It made us all feel like unique members of a secret society instead of weird outcasts. I am honored to have met “Stan the Man” Lee in person, back in 2012. I was an exhibitor at the Big Apple Con in New York City. My table was the first one by the escalator, and where everyone stopped as soon as they stepped off. Mr. Lee was no exception. But unlike everyone else, he was surrounded by fans and cameramen. He stepped right up to my table and introduced himself as if that was necessary. I somehow stumbled through my own intro and managed to say how much I appreciated his introduction of the Black Panther in his most popular comic book, The Fantastic Four, back in the 1960s. Somehow his smile got broader as he gripped my hand. He leaned closer, and said, “Wait until you see the movie!” I was floored! What I didn’t think to say, was that I was grateful for something else he did. Because he was instrumental in more than introducing one character of color. Marvel Comics introduced people of color in many of their comic book stories. That’s right; black cops, Asian students, and more. In an age where characters of color were either non-existence or marginalized into negative or demeaning stereotypes, he took a different tact. Perhaps it can be simply stated as, dignified representation. Now, this was in comic books. A medium that nobody thought was important or worthy of mention by people who were involved in “serious” writing. But Stan Lee did. This might seem trivial now, but back then it was revolutionary. They started out as background characters but before long they were scientists, newspapermen, ministers, and more. Believe me, it was a very big deal. His efforts gave me hope for change, at a time when it almost seemed impossible. He not only presented an optimistic view of the “present,” but a hopeful one of the future. So thank you, Mr. Lee, for all your fine work. May your legacy live on. Professor William H. Foster III is a long-time fan of both comic books and science fiction. He is the creator of a traveling educational exhibit on “The Changing Image of Blacks in Comics.” He has written two books on this topic: “Looking for a Face like Mine” (2005) and “Dreaming of a Face like Ours” (2010). To purchase copies go to www.Amazon.com. To find out more about his research please visit his website, www.Finallyinfullcolor.com. Vita Ayala Enters the Age of X-Man!